As lawyers we are seeing in practice a growth in unfair competition cases in the agricultural business, which often translates into hostile takeovers of agribusinesses. While previously raiders’ methods were mainly through the use of force, current invaders develop complex intellectual schemes and implement them, reinforcing their positions by means of the corruption component. The state is making progress by adopting laws against hostile takeovers, but this, unfortunately, is not enough, because raiding in Ukraine is not a natural phenomenon but a process with the involvement of certain subjects. As farmers, on our business we feel that against the background prospect of the approach of the opening up of the agricultural land market, the competition between neighboring agribusinesses set on the ground has been intensified. As a result, we are seeing a rise in rents, particularly in regions with fertile soils and easy access to the logistics infrastructure. Agro scam cases involving the sale and purchase of seeds, crop protection products, fertilizers and other supplies for the agricultural sector have increased. Knowing the psychology of farmers, fraudsters use the boom during the sowing and harvesting and lure their victims through attractive prices. Official suppliers are not able to make such significant discounts — that fact should be a big clue to farmers, but in trying to save money they become victims of fraud, losing much larger amounts, which are almost impossible to get back, usually because this unscrupulous provider is a fictitious company. Law Offices of OMP has a highly-focused, sizeable practice dealing with an extensive range of projects in agribusiness, which is the firm’s primary industry focus. The team has a consistent workflow from investors considering investing in the sector across various regions of Ukraine. The past year included performance in corporate restructuring and M&A, tax consulting and litigation. In the public domain are complex legal support to Vinnytsia Agro-Industrial Group on the sale of the company’s assets to Epicenter K; representation of Cargill AT in a tax dispute regarding reimbursement of VAT to the tune of UAH 69 million. Other typical queries from clients included structuring and management of land banks. The impressive client roster includes Cargill, Agro-region Group, Cygnet Holding, Agrokultura, Kernel Group, HarvEast Holding, Selkhozproduct Group, Glencore. Given the focus on big agrarian clients, the firm has a four-partner strong team of Kyryll Levterov, Igor Ogorodniychuk, Mykola Orlov, Yaroslav Sverdlichenko. Agribusiness is the eminent industrial focus of Alexandrov & Partners, a local counsel which has fully equipped its offering for legal work in this sector. The firm is regularly instructed for structuring investment, agribusiness assets restructuring, tax, land law (lease, emphyteusis, land bank development), financing, export-import transactions. Recent highlights take in business structuring and supporting a honey exporter to enter the EU market. Other clients for comprehensive legal support are Trigon Agri, Agroinvest group, The Bashtanskaya Poultry Farm, Ramburs. Dmytro Alexandrov is named a universal practitioner focused on agriculture. Another partner, Oksana Kryzhanivska, is growing her project portfolio and market reputation. Over the past year Sayenko Kharenko significantly enhanced its position in the agricultural sector, and stands out for representing domestic and international agricultural companies across the firm’s core practices. The team is present in high-value M&A, banking, finance and capital markets mandates, tax, regulatory and IP matters. The firm also catches the eye for solid international trade and arbitration projects. Selected highlights in 2016 include acting for the Ukrainian Grain Association on signing of the MoU on cooperation with SGS, global leading inspection and verification company; representing one of the leading global agricultural trading houses with regard to cancelling of special sanctions applied by the Ukrainian Ministry of Economic Development and Trade upon request of the State Fiscal Service. The finance team led by partner Nazar Chernyavsky acted as a legal counsel to the EBRD on providing a loan of up to USD 20 million to the subsidiaries of the Industrial Milk Company. The firm is a strong capital market counsel and advised joint lead managers of the debut USD 500 million Eurobond issue by Kernel Holdings S.A. The competition practice is loaded with related instructions, and the caseload of the international arbitration practice includes a string of disputes involving both local and global agricultural companies, led by Tatyana Slipachuk and Olexander Droug. Counsel Andrii Zablotskyi is extremely active in the agrarian sector, expanding his expertise on regulatory, trade remedies, export-import transactions, infrastructure matters and GR. Most recently he advised the Ukrainian Grain Association on various regulatory matters on sanitary and phytosanitary regulations, grain blending deregulation, export-import transactions. Asters is a full-service team with extensive industrial coverage and particular legacy in agribusiness. The sizeable multidisciplinary practice often acts on sector related financial transactions and restructuring matters, corporate restructuring, land lease, agri-items trade. With the top market antitrust practice, the firm is a primary choice for merger clearances within M&A. Asters provided full support to ED&F Man Holdings regarding its tolling transactions (processing of raw sugar cane at Ukrainian facilities). The firm regularly represents international financial institution on crediting the sector. For example, advised the EBRD in connection with USD 5 million financing provided to V.V. KISCHENZI Ltd, a privately-owned diversified agricultural producer. Alexey Khomyakov, Iryna Pokanay and Oleksiy Demyanenko are lead partners. Dentons has a premier focus on transactional work, performing complex regulatory and banking and finance matters, trade finance facilities, debt restructuring, acquisition of land, M&A. Among the clients are major international agricultural players, such as CHS and Noble Group that are advised on a series of issues related to their activity in Ukraine. The recent project is acting for CRI Group Limited in connection with the debt and corporate restructuring of Mriya Agro Holding. Ihor Mehedynyuk and Volodymyr Monastyrskyy are lead partners. on acquisition of a controlling stake in Vinnitsa Agro-Industrial Group. The banking and finance team headed by Yulia Kyrpa advised Agroprosperis Bank, the Ukrainian subsidiary of NCH Group, in the course of obtaining a subordinated debt from its shareholder for the purposes of fulfilling the capital requirements of the National Bank of Ukraine and further financing of the agrarian sector. Her team also advises on trade and acquisition finance. Managing partner Denis Lysenko increases his involvement in taxation, and advised a Ukrainian group of agricultural companies on tax matters in pre-sale restructuring. The competition team guided by counsel Sergey Denisenko advised on Ukrainian merger control issues in connection with acquisition by Koninklijke Bunge BV of two European oilseed processing facilities from Cargill Group. AEQUO’s niche arbitration practice is led by Pavlo Byelousov, counsel. AGA Partners is a team that is fully dedicated to agricultural clients, widely referred for specific commodities trade and international arbitration. The firm commands an established niche in the sector given that 7 out of the 10 biggest Ukrainian agribusiness companies are among its clients, namely ViOil Industrial Group, MHP, COFCO Agri, ADM, NCH, State Food and Grain Corporation of Ukraine and Ukrlandfarming. In 2016 the team recorded about 25 arbitration processes within GAFTA, FOSFA and LMAA institutions. In a recent highlight the firm represented Bizon-Import LLC (Poletehnika) in a dispute with a Japanese manufacturer of agricultural machinery, under a contract on delivery of goods that was affected by the military conflict, and resulted in an amicable settlement. Another landmark matter is a FOSFA case where the firm represents Agroprosperis LLC (part of NCH Capital Inc.) in a dispute with a Russia-based agrarian holding that arise out of the ban imposed by Russia on the import of Ukrainian goods. Partners Aminat Suleymanova and Ivan Kasynyuk received strong market feedback. Irina Moroz is particularly active in GAFTA cases. ARBITRADE is a highly specialized commodities arbitration and litigation firm. In 2016 the firm received a number of positive decisions in soft commodities arbitrations (GAFTA and FOSFA); advised on structuring transactions (including complex transactions on purchase of large volumes of commodities from Malaysia and Brazil; financing; transshipment; restructuring). ARBITRADE has successfully represented a claimant, EFKO-Trade LLC (Russia) in a FOSFA arbitration; and received four decisions of GAFTA in connected cases in favor of its long-standing client, the State Food and Grain Corporation of Ukraine. Andriy Shulga and Yuliya Chernykh are primarily involved in the practice. The diverse experience in the agricultural industry features the full-service offering of Arzinger. The firm is involved in comprehensive corporate projects, tax, competition, land use, regulatory and other ongoing matters of the agricultural business. The antitrust and competition team obtained merger clearances from the AMCU for one of the largest agricultural corporations of Ukraine in connection with a number of transactions completed by some of the group’s companies without subsequent clearance as part of the mergers amnesty announced in September 2015. The team of the South Ukrainian Branch, led by Odesa-based partner Andriy Seliutin, represented a shareholder of a world famous U.S. agricultural trading group in disputes with a group of affiliated companies in the city of Mykolaiv, associated with a shortfall of grain and grain products worth upwards of UAH 320 million. The international arbitration practice led by Lviv-based partner Markian Malskyy enjoyed a consistent sectoral following. In the past year the firm explicitly expanded its debt restructuring portfolio with distinctive representation of lenders, handled by Oleksander Plotnikov. Partners Anna Zorya advises on corporate and M&A, and Kateryna Gupalo focuses on tax litigation and white-collar crime. Eterna Law (new name which emerged as a result of the merger of AstapovLawyers international law group and Baltic Business Group) advised a range of national leaders — producers and traders on international arbitrations, especially GAFTA and FOSFA, as well as LMAA. Clients have traditionally instructed its corporate and tax teams on trade, M&A and related disputes. The client list includes Artis-Agro Export, EFKO, Ukrenergy Trade. Partner Eugene Blinov has a substantial track record of specialized arbitrations in his professional profile. 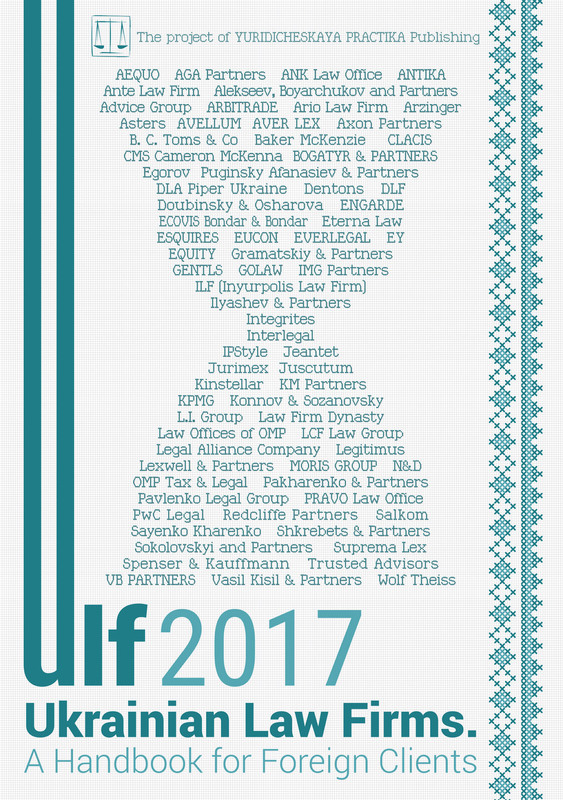 ILF (Inyurpolis Law Firm) is the Kharkiv regional market’s leading counsel that significantly sharpens the agrarian market of Southern Ukraine. The scope of multi-disciplinary team ranges from business structuring for further export activity, EU market entry and attracting finance; employment, unfair competition and IP, tax litigation, debt collection and other commercial and regulatory disputes. The innovative highlight of the firm is its pro bono support of the establishment of agro-food cluster in Kharkiv Region, where the firm represents 25 agrarian companies. ILF is the key counsel for sectoral M&A in the region, with a wealth of experience of supporting inbound and outbound investment. Among the consistent publishable clients are BASF, RIAL meat processing plant, AgTech Ukraine, Panorama Agro. Artem Naumov is a lead partner who thoroughly enhances the firm’s dedication to the agrarian sector. Widely referred by market participants for its domestic agrarian clientele, IMG Partners acts in a range of commercial disputes, debt recovery litigation, bankruptcy proceedings, advises on specific land, tax and corporate matters. Managing partner Ihor Melnyk is a recognized name for sector specific advice. Mykola Struts is known for his bankruptcy focus. Selected clients are Mriya Agro Holding, Creative Group, Cygnet Agrocompany, PJSC Ilyichevsk Oil and Fat Industrial Complex, Odesa Fat and Oil Plant, Nash Kraj. First and foremost, KM Partners has a specific tax expertise in the agrarian sector. As a renowned tax practice, the firm became a point of choice for multinational agrarian players for representation in tax disputes, particularly the cancelation of tax notices and VAT refund. The vast tax practice also includes the extensive consultancy side. The firm has got involved lately in infrastructure projects. Partners Maxim Oleksiyuk and Alexander Shemiatkin participate in these projects. Alexander Minin, the most respected tax lawyer in the country, is highly regarded for tax advice in the agrarian industry. Integrites is a growing legal market force with a diverse offering for sectoral clients. In order to cover major business needs, over the last couple of years the firm has rapidly gathered vivid practitioners and completed its partnership with a slew of recognized names. The firm ensures support in corporate structuring, land acquisition and operations management, trade and project finance, tax and regulatory advice, investments, port and infrastructure projects, trade and sales both inland and internationally, as well as resolution of relevant disputes. Notably, the firm demonstrated a dramatic increase in specific dispute work, and remarkable arbitration portfolio led in 2016 by highly active partner Olena Perepelynska. Renowned trade expert Ivanna Dorichenko joined the firm as a partner and head of its London office. She assisted the State Food and Grain Corporation of Ukraine in the resolution of a trade dispute with UK buyers and Indian/Pakistan receivers due to allegations of inferior quality of shipped cargo. The banking team often advises on trade and project finance. Vsevolod Volkov advised Agrogeneration S.A. on EUR 10 million pre-export trade finance facility from the financial division of Quadra Group. Other partners Oleksiy Feliv (land, real estate and infrastructure) and Svyatoslav Sheremeta (corporate) round off practice diversity. Highly-dynamic Ukrainian law firm AVELLUM has a solid corporate finance offering, and had a presence in several benchmark deals in the agrarian sector. The strong banking and finance practice has been involved in a range of high value finance and significant cross-borders restructuring mandates, working mainly on the lenders side. The team, guided by Glib Bondar, acted as a Ukrainian law counsel to the EBRD in connection with renewal of the USD 40 million secured syndicated pre-export loan facility to the Industrial Group ViOil; advised a group of current creditors of Mriya Agro Holding on a complex structured finance deal of a bridge loan to cover the company’s working capital needs until the harvesting campaign. Apart from traditional dedication to corporate and M&A work led by Mykola Stetsenko, the firm has of late been increasingly active on the tax and litigation fronts. The dispute team, as led by Dmytro Marchukov, has acted for the trustee under two issues of Eurobonds of Mriya Agro Holding Plc in the litigation on enforcement of claims (almost USD 600 million) against 68 Ukrainian sureties under Eurobonds. Praised for its expertise in corporate finance and capital markets, the Kyiv office of Baker McKenzie renders advice on transactions involving securities, debt restructuring, antitrust and infrastructure projects. Notably, the office acts for both international investors and large Ukrainian agricultural holdings. In 2016 the firm acted on the first landmark transaction in the infrastructure over the last couple of years and a legal counsel to Cargill in respect of an agreement with MV Cargo on construction of a new port terminal in the sea port of Yuzhny. The busy antitrust practice represented Bunge, a global agribusiness and food company, and Wilmar, an Asian leading agribusiness group, in merger control filings related to the establishment of a JV, for the purpose of production and distribution of the soybean oil in Vietnam. The projects are led, respectively, by focused partner: Viacheslav Yakymchuk (corporate, M&A, private equity and equity capital markets), Oksana Simonova (competition) and Lina Nemchenko (real estate and construction). The cross-practice team of Vasil Kisil & Partners includes practitioners in the area of land, corporate, contract, tax, intellectual property, labor law and litigators. The firm rendered legal advice to the Ukrainian Club for Agricultural Business on a variety of issues of corporate, tax, regulatory, land, commercial and other nature. Under the guidance of managing partner Andriy Stelmashchuk, the firm represented New Century Holding (NCH) in a series of court disputes regarding lease of land plots. The key figures according to their practice focuses are Volodymyr Igonin (corporate), Tetyana Berezhna (tax), Oleg Kachmar (dispute resolution). Egorov Puginsky Afanasiev & Partners Ukraine provides a wide scope offering for industry clients by creating project groups comprised of professionals in arbitration and litigation, capital markets, competition, corporate and M&A, finance, tax and real estate matters. Most recently the firm advised Altera Azteca Milling Ukraine on Ukrainian law issues related to complex corporate restructuring, as well as on implementation of a sophisticated corporate model; advises Enza Zaden, a plant breeding company, on a supply agreement; the world’s leading corn flour and tortilla production company on various business structuring matters. Oleg Boichuk leads the agriculture team. The Kyiv office of CMS Cameron McKenna advises major Ukrainian and international agricultural companies on M&A, commercial and financing issues. In the recent transactional workflow the office acted in the main on behalf of lenders, boosting expertise in high value financing, restructuring and litigation. The team also acted on a landmark infrastructural project, having advised MV Cargo on joint venture with Cargill for the construction of a new grain terminal in the Ukrainian Black Sea port of Yuzhny. Olga Belyakova is a lead partner, and is supported by the team of Kateryna Chechulina, Vyacheslav Ovechkin, Anna Demchenko. The Kyiv office of DLA Piper possesses transactional capacities and acts on cross-border M&A, debt restructuring and tax matters. The office is empowered with predominantly international clientele. The multidisciplinary team includes: Oleksandr Kurdydyk (finance), Margarita Karpenko (corporate and M&A), Illya Sverdlov (tax). Given extensive experience of advising agribusiness, EY Ukraine is hired for ongoing advisory, structuring and restructuring, and transaction support. The team is empowered by its international network and is preferred for comprehensive multijurisdictional projects. EY advises a Central European business group on the sale of its Ukrainian agricultural business to multiple buyers via a bidding process. The main figures are partners Albert Sych and Igor Chufarov, and Bogdan Malnev, senior associate. In 2016 EVERLEGAL, a Ukrainian law firm whose core team has solid transaction experience, continues to grow its M&A track record. The firm acts on behalf of buyers, and recently acted for a specialist Czech investment firm on the acquisition of a number of agri-businesses in Ukraine. Another highlight is the team’s involvement in several auction sales, when it advised a Ukrainian agricultural holding in connection with the acquisition of a Ukrainian agricultural business from a Balkan investor. Managing partner Yevheniy Deyneko is the main contact. Ilyashev & Partners is mostly known as a highly-specialized litigation and arbitration force, heavily involved in cross-border matters and criminal defence. The firm has a sizeable bankruptcy practice, and supports the sound bankruptcy procedure of Creative Group. Moreover, Creative is represented in the High Court of England and Wales, in LCIA arbitration, arbitration on ICC rules in Munich, and in commercial courts of Ukraine and Cyprus in disputes with an international consortium of banks regarding recovery of loans worth USD 80 million. Noble Group, Danone, KWS Ukraine, OLAM Ukraine, Agrein Group are also part of its client roster. Mikhail Ilyashev is the lead partner. As a prominent domestic litigation force LCF Law Group adds agrarian clientele to its caseload, which encompasses corporate, banking and tax disputes, bankruptcy proceedings. The firm represents Mriya Agro Holding in its ongoing USD 35 million litigations with Ukrainian and foreign lenders. AVK Group, a Ukrainian confectionary producer, is represented in large stake ongoing debt recovery litigations with Ukrainian banks. Other selected clients include Tovstenkovsky Starch Plant and the PJSC Kupyansk Milk Сanning Factory. Both partners Anna Ogrenchuk and Artem Stoyanov are actively involved in litigation practice. The full-service firm Gramatskiy & Partners is preferred for export programs support, technical regulation, land, corporate, finance, indebtedness restructuring and sector related regulatory issues. The firm is experienced in projects providing export financing for entering the European, Middle East and China markets and developing legal schemes of cross-border trade. Most recently the firm advised AgroAlliance Group on corporate reorganizations, land lease agreements, contracts with exporters and traders. Other clients include Finrostorg, Lavinia, AgroTechnologies, Shenzhen Ruiben Import and Export Service. Iegor Ignatichev oversees matters in the agricultural industry at the firm. GOLAW, a domestic law firm headquartered in Kyiv, with an adjusted regional presence in Lviv and Odesa, regularly improves its capabilities to support investments in agribusiness. The firm is mostly active in litigations acting for investors in the sector, contractual issues and restructurings, agrarian receipts and regulatory matters. The firm acted for its consistent client Syngenta, a global Swiss producer of agrochemicals and seeds, on formalization of its relationships with contactors; advised Kron-Bartis on foreign trade transactions and currency regulation in Ukraine, and agricultural machinery leasing. Some other clients include Vitagro and Donegal FRS. Both partners Valentyn Gvozdiy and Sergiy Oberkovych oversee the projects. International Legal Center EUCON is known for its experienced tax team with specific industry wise knowledge. Given its strong tax litigation history, the firm acted for Mikogen Ukraine and Zhoravske Agricultural LLC in tax disputes. Additionally, the center grows advisory in tax structuring and international tax planning, Ukrainian-Polish inbound and outbound investments. The firm operates throughout two offices in Kyiv and Warsaw. Tetiana Samsina, senior partner, is the key point of contact. ANK Law Office, the Odesa-based legal counsel with especial focus on port infrastructure, recorded an increase in legal inquiries from grain traders, operators of grain terminals, silos and freight forwarders regarding issues with grain trade, transportation, freight forwarding and grain export. The major recent clients of the office are Bunge, Vector Oil Trade, Olimpex Coupe International, FERKO, Kernel, Louis Dreyfus Commodities, Risoil S.A. Alexander Kifak, Artyom Volkov, Dmitriy Kolodiazhniy are lead partners. EQUITY (called FCLEX up till June 2017) is focused on advising domestic clients, big agrarian market players, providing litigation, debt restructuring and criminal defense service. The firm acted for the Soloduсhin agricultural company in a USD 7 million debt recovery dispute with Delta Bank, and represented the interests of officials from Creativ Group in a number of criminal proceedings. Diverse instructions of agrarian clients are managed by three partners, namely Andrey Nikitin, Vyacheslav Krahlevych and Taras Poshyvanyuk. Spenser & Kauffmann, which is active on the market throughout 2016, mostly present in corporate matters, ownership rights protection, sectoral acquisitions and land bank development. Aleksandra Fedotova, partner, and Maksim Maksimenko, counsel, are the key contacts. Despite rapid diversification of its clientele, Moris Group still enjoys a legacy for vast workflow in the agrarian sector. The scope of work includes finance, tax and corporate practices. Among the best known clients is the vertically-integrated agricultural holding AvangardCo. Managing partner Andriy Romanchuk is the main contact. Based in Odesa, law firm DE-JURE renders regularly support to players of corn and fumigation market, arranging contracts supervising and tax planning needs. Its client list takes in Ukrmortransservice, Baltic Control Ukraine, Glenport Odesa and others. Gregory Tripulskii and Andrii Pavlyshyn are the main contacts. Law Firm Dynasty, the Dnipro-based law firm, has consistent clientele which entrusts the firm with dispute representations. The Juscutum Attorneys Association acts on structuring agribusiness and supports asset deals. Gryphon Legal advised on insurance of agricultural risks in Ukraine and subsequent issues of economic competition. In 2016 ENGARDE’s corporate team, headed by Andriy Vyshnevsky, was involved in representing sectoral clients in debt restructuring.